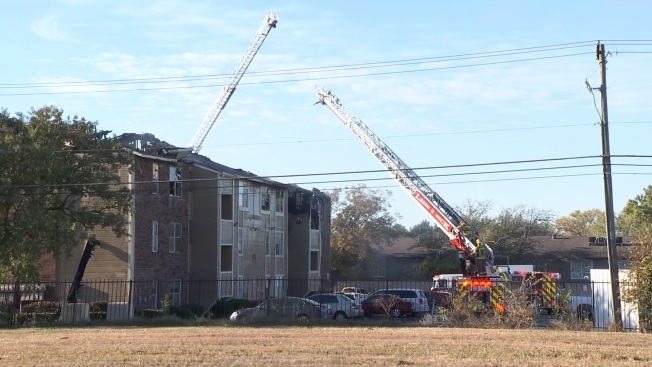 From three stories up, six people leapt onto mattresses held by good Samaritans and dropped a baby to rescuers on the ground to escape a massive apartment fire in Dallas Wednesday morning. “I didn’t want my daughter to lose her life, he (good samaritan) told me just trust me I got her, I got her, so without even thinking I just dropped her," Shuntara Thomas, who dropped her 1-year-old daughter to safety said. Residents of the Meadows at Ferguson apartments on the 11700 block of Ferguson Road were awoken at about 7 a.m. to police officers and other rescuers banging on doors alerting them to the fire. Dallas police officers were the first to arrive at the scene after spotting smoke billowing from the building, according to Jason Evans, Dallas Fire-Rescue spokesman. Evans credited police for going door-to-door, alerting residents to escape while others dragged mattresses from homes to serve as improvised landing pads for people trapped and willing to jump to safety. Dallas Police released video from one of the officer's body camera on Wednesday afternoon, showing the officers rushing to get everyone to safety. Witnesses on scene also caught the dramatic scene on cell phone video as the flames poured from the third floor apartment. "Everybody held the mattresses on both sides and we told everybody just aim for the mattresses," said Darren Hicks, a man visiting friends at the apartment complex who helped rescue people trapped by the fire. Six people, including a baby who had to be caught, jumped from the third-floor to mattresses on the ground below, firefighters said. "I seen a lady, she yelled out the window she was about to drop the baby. So, my first reaction, was go by the window and catch the baby. When she dropped the baby I caught the baby and curled him up in my hands," said rescuer Byron Campbell, who was with Hicks visiting friends at the apartment complex. Hicks and Campbell told NBC 5 they rushed to help to prevent a worse ending to a story where people were obviously losing everything -- they didn't want it to be any worse so close to Thanksgiving. The massive fire devoured two dozen residences, 18 of which were occupied, and left three people injured, including a firefighter who suffered second-degree burns to his shoulder and arm, authorities said. The two injured residents were transported to hospitals with injuries not considered life-threatening. All are expected to be OK. The building was severely damaged by the fire and DFR said investigators were not able to enter it to determine what sparked the blaze. The building was demolished later in the morning. DFR said firefighters attacked the fire quickly but were soon forced into a defensive posture. Firefighters were able to contain the fire to the one building and had the fire under control by 8 a.m. Video from Texas Sky Ranger showed flames shooting through the roof as firefighters surrounded the 3-story building. The American Red Cross is assisting 40 people made temporarily homeless by the fire by providing them with comfort kits and disaster assisstance. The Red Cross said all of the people impacted by the fire were moved to vacant residences in the community. Anyone else impacted by the fire is asked to call 1-800-RED-CROSS for help. Check back and refresh this page for the latest update. As this story is developing, elements may change. NBC 5's Tim Ciesco, Courtney Gilmore, Jack Highberger and Frank Heinz contributed to this report.